Playtech seem to be making a big play to produce orientally-themed online slots these days – some we can work out the translation of the title, some we can’t and this falls into the latter category. It’s called Zhao Cai Tong Zi and it’s a colourful gaming experience with a cartoonish atmosphere which marks it out from similarly-themed games – you can read all the essential details below. 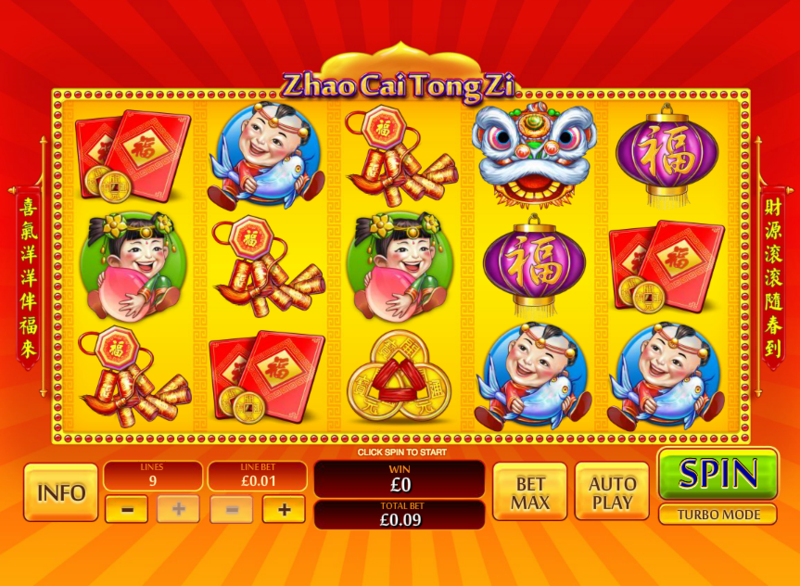 Zhao Cai Tong Zi is a five reel slot with three rows and up to nine paylines; it’s a game full of cheerful symbols and colours and the gold reels spin against a backdrop of red and orange rays. Chinese characters hang down on either side of the reels. All the symbols are related to the theme and they’re a charming bunch including four different cartoon characters carrying fish, fruit, gold ornaments and gold ingots; they are joined by a pineapple, some Chinese dollars, red envelopes, firecrackers, purple lanterns and a red bag. Wins can be formed from right to left as well as left to right and the six highest paying symbols will payout for just two in a combo. The wild symbol is a the head of a costume dragon and it will substitute for all others, multiplying any wins by 2x when it does so. 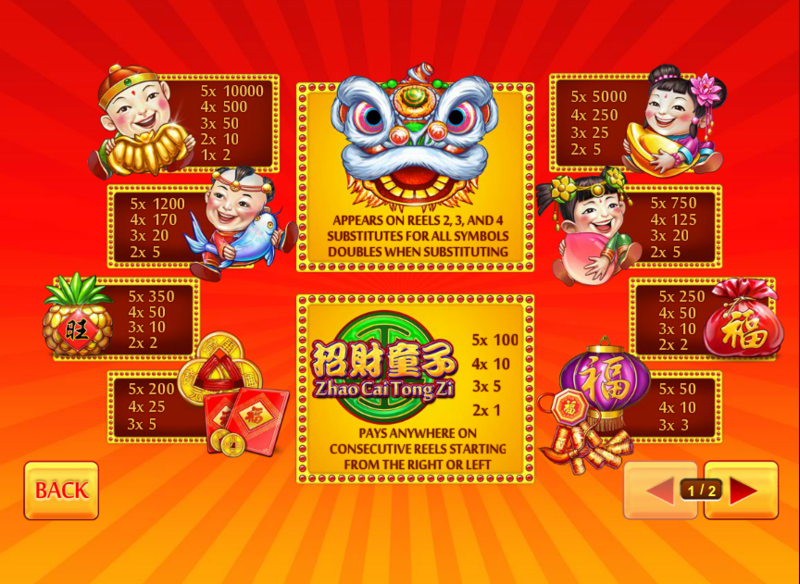 The scatter is the Zhao Cai Tong Zi logo which pays out for at least two anywhere on the reels. That’s all there is to it, there are no bonus features to complicate matters here and Zhao Cai Tong Zi is a a simple, good-looking game with plenty of small payouts. It comes with an RTP of 97.01%.